The Black Collective of Media in Sport (BCOMS), founded in 2009 by sports journalist Leon Mann, aims to be the first port of call both for black professionals in the sports media and talented newcomers looking to develop their careers. BCOMS believes that African, Caribbean and mixed race people are significantly under-represented in the sports media despite disproportionate interest in, and achievement from, the community on the field/track/court. As a network, we feel the lack of diversity across the sports media has reached a critical point. Innovative networking, sharing contacts and opportunities, training programmes. The organisation has established great relationships across the sports media and is keen to develop further partnerships across the industry. While BCOMS has a specific remit in representing the black community, our members feel strongly about all strands of diversity, including gender, disability, sexual orientation and religion. 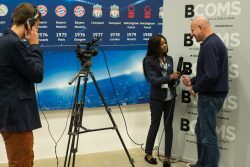 In October 2016, BCOMS organised the second ‘D Word’ conference on diversity in the sports media. Hundreds of delegates attended the #DWord2 conference at BT Sport studios in East London, to hear a host of high-profile individuals within the industry address and discuss the lack of all types of diversity in sports media. Some of the facts revealed by BCOMS on the day included the findings of research into broadcast and written coverage of summer 2016’s four major sporting events (Olympics, Paralympics, European Football Championships, Wimbledon). BCOMS are proud to have an excellent relationship with the SJA and welcome ideas, input and advice from media professionals across the industry.